Hemmed, soft cotton, mounted flag. 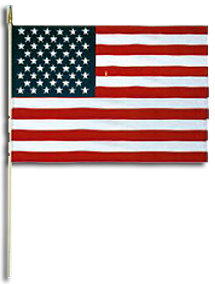 This 8" x 12" stick flag is printed on 100% cotton sheeting and hemmed on all four sides for added strength and durability. The flag is mounted on a 3/8" staff with a gold tip.